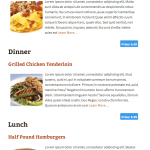 Recently, I got a chance to review WordPress plugins to create Restaurant Menu. I realized that there is room for a better, more standard compliance, and easy to manage Restaurant Menu Manager plugin. So I wrote one, and released it under General Public License. 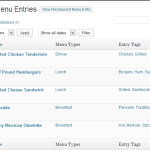 Restaurant Menu Manager allows you to easily add entries into your menu. 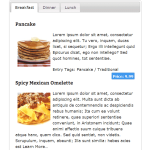 You can group those entries into menu types, for example: Lunch, Dinner, Breakfast, Desserts, etc. You can also group entries with entry tags, for example: Vegetarian, Sandwiches, Salad, Soups, etc. Add images or even a full gallery for your menu entries. Set a featured image or entry thumbnail. Allow visitors to leave comments below each entry. 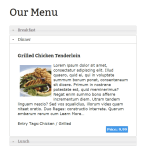 Use other WordPress plugins with your Restaurant Menu Entries. How to Use Restaurant Menu Manager plugin? Once you have installed and activated the plugin. 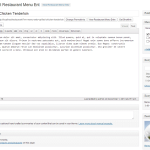 Simply go to Restaurant Menu » Add New Restaurant Menu Entry to create the first entry in your menu. Creating an entry is like creating any page or post in WordPress. Provide your entry a title. In the editor area provide details about the entry, a nice description, ingredients, nutrional information, images, etc. Set the price for the entry in the Entry Price field. Optionally you can group your entries in Menu Types and Entry Tags or set a featured image. Please note, that currently you must choose a ‘Menu Type’ for your entries. Restaurant Menu Manager displays entries grouped in ‘Menu Types’, so each of your entry should have a menu type assigned to it. However, if you do not want to group your entries into menu types, then I would recommend that you at least create one Menu Type, then assign all your menu entries into that menu type. If you have feedback, suggestion, or questions about the plugin, please leave a comment below and I will try to answer it. Thank you for providing this helpful plugin. I’m using this plugin in my website. I added the food photos from featured image. I need to enlarge the photos by clicking on them. Is there any way to activate make this work in your plugin? The plugin actually relies on your WordPress theme for showing featured images. You can use third-party lightbox plugins to open featured images in a popup window. Hi there. The menu title keeps reverting back to old title name upon saving menu with new name. How do I fix/stop this and keep it from happening again? Is there any way to change the order in which in the categories show up? I don’t want desserts listed after appetizers!!!! Is there anyway to change the font of the menu types? How do I get rid of the show more and just have it display the entire block of text? When I installed it and put a few items in they don,t line up. Hello, is it possible to display to different menus on 2 different pages. I have created the lunch with no problem but I don’t see how to create a seperate one just for breakfast. i have the some problem , is possible display 2 different menu ?